In April to May in 2018 ​a group came together to create a song and a lesson plan for children that raises awareness about fighting for freedom and equality. 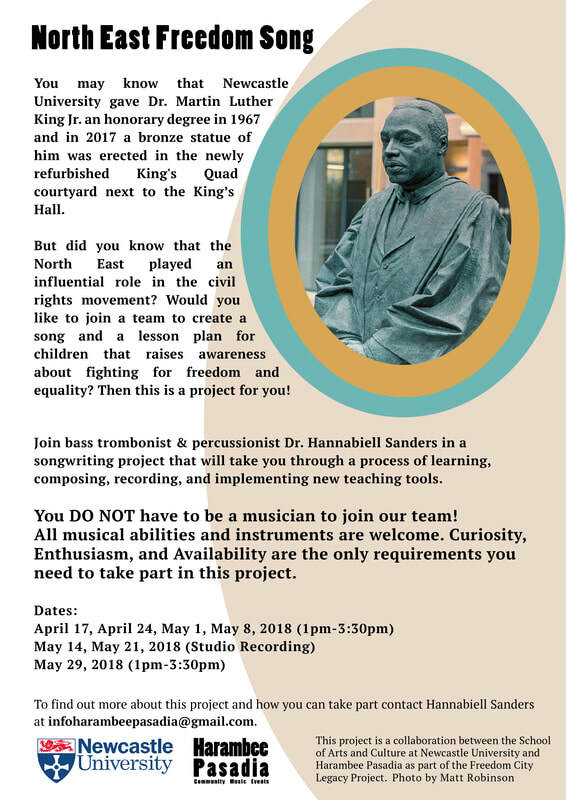 Led by bass trombonist & percussionist Dr. Hannabiell Sanders this songwriting project took participants through a process of learning, composing, recording, and implementing a new Lesson Framework. The project was inspired by the anniversary of Dr Martin Luther King Jr. receiving an Honorary degree at Newcastle University. On 13th November 1967, Newcastle University awarded Dr Martin Luther King Jr. an honorary degree, the only UK university to do so in his lifetime. Dr Martin Luther King Jr. was a social activist and Baptist minister who played a key role in the American civil rights movement. He fought for equality and human rights for African Americans, the economically disadvantaged and all victims of injustice. On accepting this award Dr King made his final public speech outside of the United States of America before his assassination in April 1968. During his acceptance speech, he called for us to join him in the ongoing struggle against war, poverty, and racism. To commemorate the 50th anniversary of Dr King’s Honorary Degree a city-wide programme called Freedom City 2017 was launched. The programme included a city-wide arts and cultural festival, educational outreach to inspire a new generation, and a bronze statue of Dr King was erected in the King's Quad courtyard within the Armstrong Building at Newcastle University, UK. The Aim of this Framework is to introduce young people to Human is My Name the song created as part of the North East Freedom Song legacy project. The North East Freedom Song legacy project was a collaboration between Harambee Pasadia CIC and the School of Arts and Culture at Newcastle University in response to Freedom City 2017. This project was funded by the School of Arts and Cultures at Newcastle University. Human is My Name: Educational Song and Materials about Human Rights through the lens of Martin Luther King Jr. This teaching pack is designed to introduce young people to Martin Luther King Jr., human rights, and the links between music and social activism. It contains links to a specially written song ‘Human is My Name’, its backing track, and related teaching activities with prepared materials for schools (targeted but not exclusively at Key Stage 2 and 3) and other groups. All the activities are designed as springboards for groups to use in their own projects, lessons, and activities.